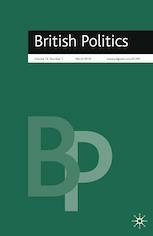 This journal promotes a holistic understanding of the topic of politics in Britain, by encouraging closer integration between theoretical and empirical research, between historical and contemporary analyses, and by fostering a conception of British politics as a broad and multi-disciplinary field of study. British Politics incorporates a range of sub-fields, including psephology, policy analysis, regional studies, comparative politics, institutional analysis, political theory, political economy, historical analysis, cultural studies and social policy. The research papers and review articles chosen for publication reflect all theoretical perspectives, often linking contemporary developments to theoretical and/or historical analyses. Broad in scope, the journal seeks to function as a counterweight to the growing trend during recent years toward fragmentation of this field. The journal operates on the guiding principle that if research is related to the field of British politics in a broader and fuller sense, it is both more useful, and more meaningful. Coverage extends to all aspects of British politics, including policy developments, institutional change and political behavior.